Like every other principal avenue in Toronto, Yonge Street between Rosedale and Summerhill subway stations has been targeted by the city for residential intensification. But it seems that we have not made up our collective mind about how the development of this spot is supposed to appear. Should the new architecture nod politely to the poshly tradition-minded, low-rise Rosedale neighbourhood, whose western frontier Yonge Street is? Some condo builders seem to think so. The result has been a spate of vaguely historical confections along Yonge that aren’t worth a second glance. Or should the styling express Toronto’s cosmopolitan modernity, and to heck with Victoriana? 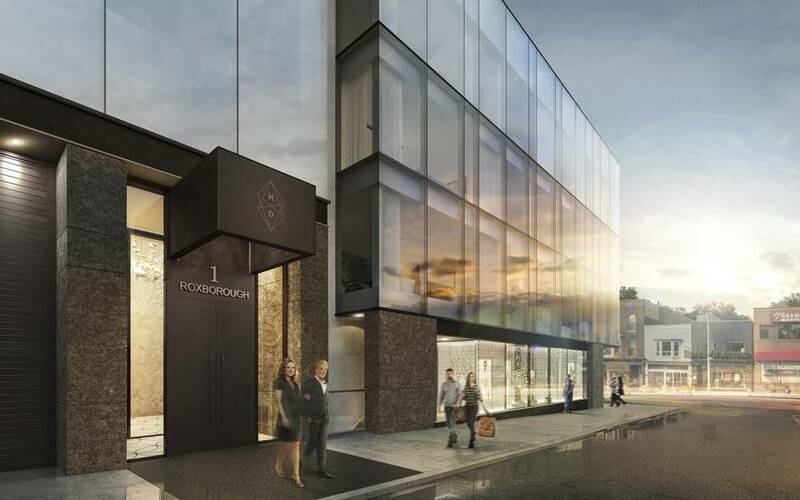 Before coming down on one side of this issue or the other, consider the future of 1027 Yonge St., at Roxborough Street East. The site is currently occupied by a kind of dumb-looking, three-storey modernist office block from the 1970s. While it has solid bones, some of which will be recycled into the building slated to go up there, this homely edifice will not be missed. The new construction, a mixed-use mid-rise, is the handiwork of Old Stonehenge, a Toronto development company. 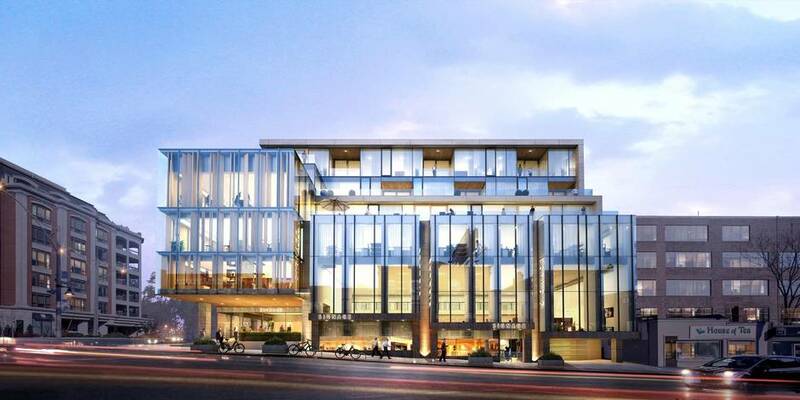 For the record, Hill and Dale (as the six-storey project is titled) will feature shops at grade, a layer of office space and, on the uppermost levels, 17 residential suites that range in area from 871 square feet up to 3,600 square feet. All units are provided with terraces, 144 square feet to almost 2,400 square feet in size. 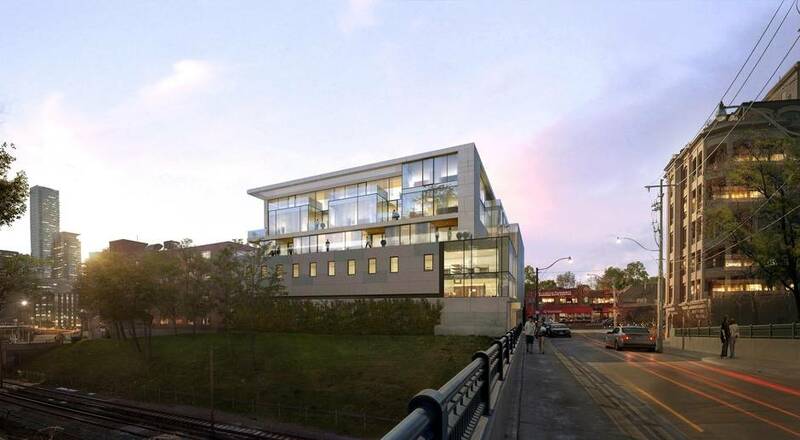 Price-tags on the apartments start at $1-million. Such numbers suggest that Old Stonehenge’s likely clients will be people downsizing from the mansions of Rosedale and other affluent Toronto districts where spacious family homes are standard. 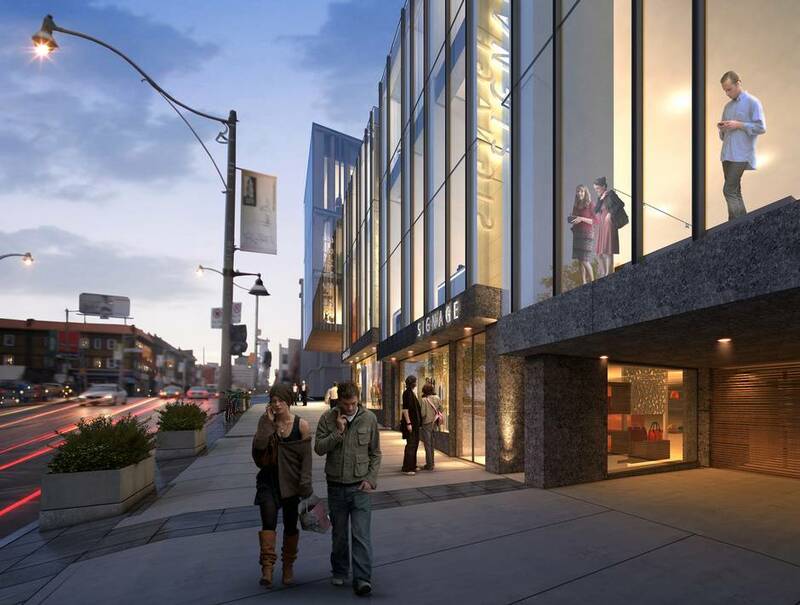 The residences will help bring deluxe living westward, over the clattering subway line, to the edge of busy Yonge Street. They are, one thinks, pitched to the neighbours. But what does Hill and Dale promise to give to the the citizenry at large, who must live with the buildings developers raise on our downtown streets? Urban design – how a structure behaves artistically at both the local and metropolitan scales – matters, especially when the mid-rise in question proposes to make its statement on one of the city’s most important thoroughfares. If built out as envisioned by Jaegap and Sue Jean Chung, partners in life, art and business (JCI Studio), this complex will probably win several points on anyone’s urban design score-card. It is large, but not too tall for its mixed-size context. As mid-rises are supposed to do these days, this one features notch-backs above the third storey that prevent the building from looming over the sidewalk. The façade, its glazed expanses framed by thin strips of stone, is articulated into a series of vertical elements that quietly animate the building’s streetside presence, and lend it an air of urbane elegance, and a certain cool formality. The architects’ restrained spatial play will probably give this rather spiritless stretch of Yonge Street a much-needed lift. Viewed as the sum of its parts, Hill and Dale seems on track to please both the empty-nesters of Rosedale and advocates of sound, sensible contemporary design. It is modern, but without the hot sauce of trendiness. It is staid, but not stodgy. It will almost certainly fit nicely into the jigsaw puzzle of Toronto’s present-day cityscape. That said, the project did resurrect a question about the building art which has bothered me for a while, and for which I’ve not found a satisfactory answer. Case in point: Hill and Dale, surely among the glassiest structures I’ve reviewed recently in this column. Can a wholly glazed mid-rise (such as this one) or high-rise perform environmentally as well as one with solid walls? When I asked Mr. and Mrs. Chung this, both replied with a firm yes. For the residences of Hill and Dale, they have specified what they described as a top-end, triple-glazed, very durable curtain-wall system engineered to keep lots of noise out--the traffic on Yonge at the front and the subway aft could otherwise pose sound problems--and to keep lots of energy inside. The critics of all-over glazing are right, they added, when it comes to the typical Toronto condo stack. But Hill and Dale is not typical. I hope the Chungs’ cladding is as highly efficient as these architects predict it will be, and that it becomes more affordable as time goes on. I love the shiny buildings modernity has brought us, and would be sorry if we were seeing the last of them.